Is the Samsung Gear Live the best Android Wear watch? Like its smartwatch rivals such as the Pebble Steel and the Sony SmartWatch 2, the Samsung Gear Live is not here to eliminate your smartphone. Once again, there's no SIM so this isn't a standalone device - it's just there to make life a little easier by making it possible to check your notifications without the need to take out your phone, especially if it's a large device like the Samsung Galaxy Note 3 with its gigantic 5.7-inch screen. This isn't the brand's first foray into this area - we've already seen the non-Android (and rather disappointing) Samsung Galaxy Gear plus its superior follow-ups in the form of the Samsung Gear 2 and Samsung Gear 2 Neo. But it's Google's new wearable-friendly Android Wear OS that makes Samsung's latest watch a little bit more likely to succeed. Like the rival LG G Watch, the device still requires an Android phone running Android 4.3, Android 4.4 or, if you're adventurously testing the beta, Android L.
The Gear Live is pretty comfortable but it's still rather chunky and the design hasn't really been refined that much since the Samsung Galaxy Gear. Samsung has ditched the front-facing home button from the Gear 2 and Gear 2 Neo and instead gone with a more streamlined button on the right-hand edge. That's one more than the LG G Watch, which has no home button at all or power switch at all. There's a tiny mic next to the power button that picks up your "Ok Google" voice commands. You'll find the Pogo charging terminal on the back, right above the heart rate monitor. This is also where the 'presto pins' are located - these release the watch straps. Availble in black or wine red, the straps are designed to be interchangeable, so that the watch is compatible with any 22mm watch bands. Tipping the scales at just 59g, the Gear Live is slightly lighter than LG's watch, but the downside is that it uses the stiff rubber and two-pronged clasp of the Samsung Gear Fit. The build certainly feels more premium than the likes of the Fitbit Flex although we found the clasp a little hard to fasten without some practice. While the Gear Live sports a fairly average 512MB of RAM along with 4FG of internal storage, Samsung has boosted the processor to a Qualcomm Snapdragon 400 with a clock speed of 1.2GHz, making light work of Android Wear. Bluetooth 4.0 provides the wireless link to your Android 4.3 smartphone and the Gear Live also sports Gyro, compass and compatibility, but unlike the Gear 2 and Gear 2 Neo you won't get IR or NFC. The Gear's watch face is a 1.63-inch Super AMOLED screen with 320x320 resolution, resulting in a remarkably vivid 278ppi. Obviously it looks best at the highest brightness, but you'll want to turn that down if you want the battery to last the day. The LG G Watch's screen is slightly larger but with a lower resolution. Designed specifically for wearables, Android Wear is a simplified version of Google's mobile operating system. Using a card-based interface, it clearly takes it cues from Google Now and Google Glass UI. The scarily intelligent personal assistant offers commute times based on calendar events or places you commonly visit at certain times of the day. It also knows which teams you support, based on search, and will keep you posted with real-time scores. It'll also keep you up to date on birthdays and appointments with the info automatically sitting underneath the time. You can swpie up and down moves between different Google Now notifications, while flinging them to the right dismisses them, Tinder-style. Moving left gives you more options. Just like Google Glass, saying "Ok Google" any time the screen is active will enable you to do things like open apps or search. And also just like Google Glass, it works most of the the time, but there can be mistakes especially as it doesn't wait long enough before cutting of your sentence. The app selection is pretty thin on the ground at present although we're hoping this will change now that developers have hold of it. As always, some apps in the list are better than others. Google Maps is great when asking the watch, "OK Google, navigate to..." - the route appears on the phone, along with turn-by-turn directions. This is especially handy when driving. The device doesn't have a speaker but you can call up a song which is then pushed to your phone thanks to Google Play Music - good news for the gym. Also practical when working out are Runtastic and Runkeeper, allowing you to start running, biking and tracking other exercise sessions without fiddling with the phone. Google Fit is built in and can track daily steps along with your heart rate. Compared to other fitness wearables like the Jawbone UP24, we found neither to be particularly accurate. For now, the Gear Live is only compatible with Android phones running 4.3 or later. The iPhone isn't compatible - not a problem right now it could be an issue when the stylish Moto 360 finally launches. The Gear Live uses a 300mAh battery (compared to the LG G Watch), which means that it only last about a day, while the LG will give you a little longer - more like a day and a half. The device is charged using a proprietary Pogo charger so small enough to put it in danger of being easily lost. 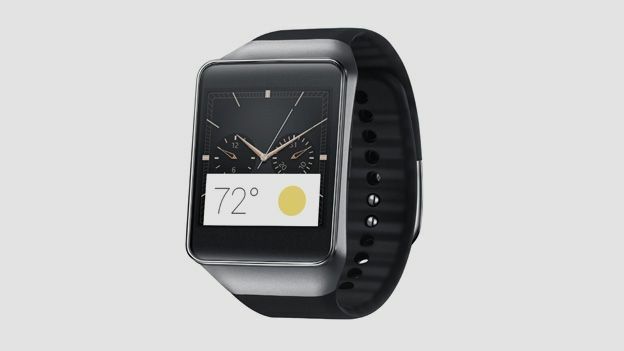 For many, the smartwatch is simply not a must-have product yet. It might never be. However, there are also those that appreciate the convenience it offers for checking your notifications quickly without having to take out your phone. While the Samsung Gear Live and the LG G Watch are the first Android Wear devices to emerge, there are more in the pipeline, not least Motorola's Moto 360. Samsung's Gear Live has the advantage over the LG G Watch thanks to its higher resolution screen, and its physical home button, which makes getting back to the home screen much quicker than on the LG. However, there's not a lot between them. The Gear Live's uninspiring design suggests that this is for early adoptors and very few other people and like any fledgling OS, Android Wear also needs more apps. There's no great leap in the hardware: this is all about Android Wear. The potential is there, but the Gear Live is far from perfect.